When most people think of South Florida, Fort Lauderdale is the first city that comes to mind. Beautiful homes and beaches, along with celebrities and other famous people, make the area a premier destination. Also known for homes that define luxury, those homes are often built with marble floors and other marble surfaces such as walls or countertops. As with any type of surface, over time wear and tear takes its toll and they need some TLC to restore their previous beauty. 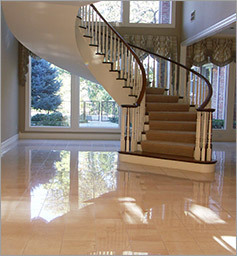 When your marble floors or surfaces need TLC, let us at Classic Marble Restoration breathe new life into your home. As the premier Fort Lauderdale marble floor polishing company, Classic Marble Restoration is here to make sure your home will always look its best. Our team of skilled stone technicians are always being trained on the latest techniques used to clean, polish, seal and grind stone to make it look as good as new. In fact, our technicians are so highly-skilled that many of our finished jobs have been featured in leading home restoration publications, and we have been recognized for providing some of the best customer service and job results of any company in the industry. Offering free estimates and years of experience, we at CMR strive to provide the best service and the best results to our customers. Contact us today, and we'll be glad to come to your home and offer not only recommendations, but our proven solutions to making your home beautiful once again. For many homes in Aventura, the keyword is luxury. Known for having some of Florida's most luxurious homes, Aventura boasts some of the Sunshine State's most beautiful displays of marble and other stone in its homes. Whether it's floors, countertops, walls or other areas of a home, Classic Marble Restoration is here to serve your needs. Having worked hard to obtain our reputation as the marble restoration experts in South Florida, we use the latest techniques and our highly-skilled technicians to give your home the special treatment it deserves. 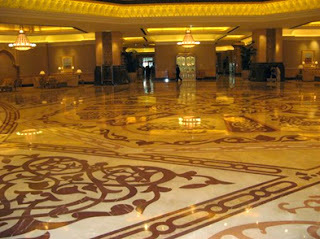 When you are in need of an Aventura marble floor polishing company, look no further than us here at CMR. Whether you've got stone, granite or marble we are happy to help you restore your home's beauty quickly and affordably. We at CMR take customer service very seriously, so we understand how much your home means to you. When our expert technicians visit your home, they will listen to your concerns and respect your wishes. Our goal at CMR is to make sure each and every job is completed to our customer's liking and satisfaction. We offer free estimates prior to beginning any job, so there's no need to worry about any pricing questions before, during or after the job. Our technicians are skilled in such tasks as grinding, polishing, cleaning, sealing and much more. Feel free to give us a call today or send us an e-mail, and we'll be glad to help make your home as beautiful as ever. 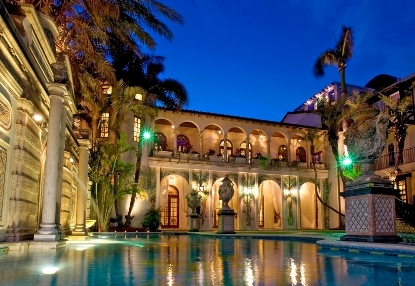 Like many places in Florida, Boca Raton has some of the most beautiful homes in the Sunshine State. With the recent increase in home building and renovation, Boca Raton has become one of the most desirable places in which to love. 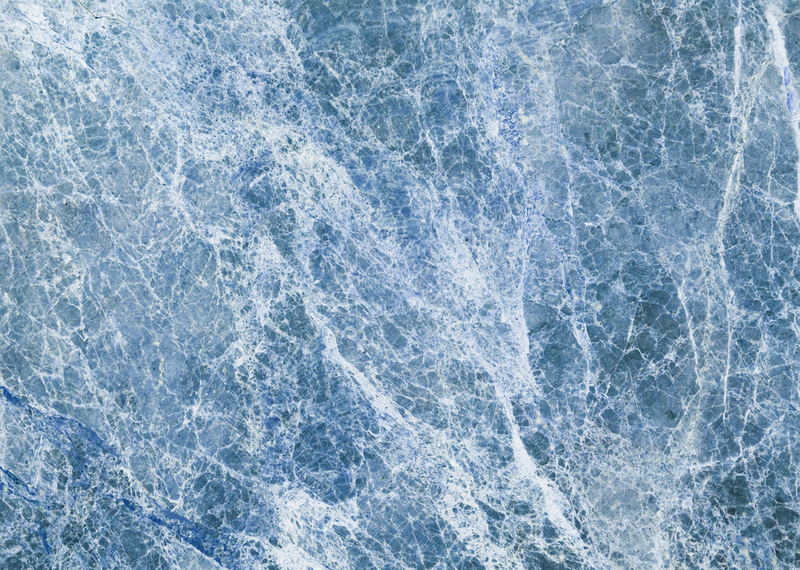 More and more homeowners have chosen to incorporate marble into their homes, with many of them having homes with beautiful marble floors or countertops in their kitchens. Yet just like other surfaces, marble does need to be taken care of regularly in order to maintain its beauty. When homeowners need a Boca Raton marble floor polishing company that can help keep their marble looking like new, they turn to Classic Marble Restoration. Whether it's polishing a marble floor in a living room or cleaning marble countertops in a kitchen, we at Classic Marble Restoration are always prepared to do the best possible job for you and your home. Marble floor polishing can be a tough process, but with our highly skilled technicians we can make the process as easy and convenient as possible. With a reputation in South Florida that's second to none, CMR always uses our many years of experience and skills learned from the latest training techniques to make your home look like new. Offering free estimates and friendly customer service, we are always willing to go the extra mile to ensure each and every customer is happy. Give us a call today, and soon your marble floors and countertops will be looking as good as new. In many of today's most luxurious homes, marble surfaces are added to give them a look and feel of days gone by. Entering a home and walking across a shiny marble floor, gazing at beautiful marble walls in a living room or fixing a meal in a kitchen with marble countertops all add up to a beautiful home. Florida, known as one of the most beautiful places in the United States, is full of homes that offer luxury seen in few other places around the world. Yet to keep them looking beautiful, regular maintenance and work is required. When luxury homes in Fort Lauderdale need their marble surfaces restored, they turn to the expert technicians at Classic Marble Restoration. 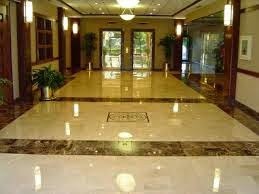 Using our many years of experience, we are widely recognized as the premier Fort Lauderdale marble floor polishing company. Because of our knowledge and experience working with marble restoration, we understand the specific needs of many homes. Our technicians are always learning new techniques to help them clean, polish, seal and grind marble and other surfaces. Putting a high value on customer service, we make the marble restoration process easy and affordable. We're committed to making sure each customer is fully satisfied before we leave any job, so we'll work with you on all aspects of the job to see it's done correctly. Contact us today for a free estimate, and we will come to your home and offer our suggestions as to how your marble surfaces can look new once again. Soft stone materials such as marble or limestone on countertops and fireplaces requires special care to prevent damage from harsh cleansers and equipment. Classic Marble Restoration located in Plantation, Fla., provides expert cleaning, polishing and restoration of natural or treated stone at residential or commercial properties. We know how to clean difficult stains such as soot from stone fireplaces without marring surfaces. Our technicians use a small amount of gentle cleanser to rub away debris from stone, instead of saturating the material with chemicals that cause damage. Gentle cleaning methods also help to avoid dissolving grout and adhesives that hold stone tiles in place. Plam Beach marble cleaning is vital to remove sharp particles of sand that blow on exterior surfaces such as patios near swimming pools. Our technicians can also use buffer machines with soft pads to remove embedded debris from interior surfaces. After removing grime, a polishing machine suctions the debris quickly. The technicians working for Classic Marble Restoration understand how to find private residences and businesses throughout the Palm Beach area to perform natural stone services. 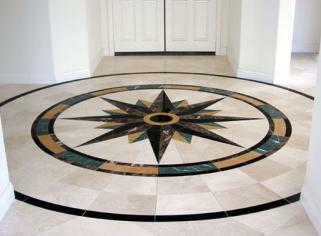 We understand how to clean an assortment of stone such as travertine, terrazzo and shale. South Florida marble restoration from knowledgeable technicians can prolong the life span of natural stone countertops, walls and floors. With frequent polishing, our customers will enjoy seeing an improved color and texture on stone surfaces. With the holidays right around the corner you have little over a week to have the house read for friends and family that will arrive on your doorstep. Classic Marble Restoration is a father and son team that understand the importance of family and making the house look good for their arrival. 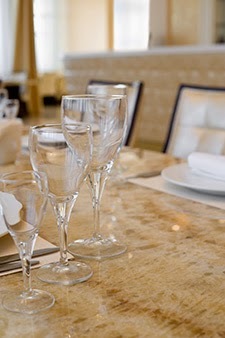 We want to help you ensure that your marble surfaces are in their best shape for guests. So whether we are looking at minor scratches and dulling or chips, we can help you get the best look out of your marble and stone surface before the holiday season and bring them back to life for the New Year. All natural stone surfaces, not just marble, require proper maintenance and care to make them look beautiful. Classic Marble Restoration has a cost effective maintenance program that will have your marble or granite surface looking like new for years to come. Our marble maintenance programs can include anything from a monthly program to an annual one. Usually we see our customers taking a more regular approach to surface cleaning with bi-monthly and quarterly maintenance programs. However we create every plan to your specific needs and budget. All our programs offer the entire list of our services from restoration, to cleaning, sealing and polishing. We are a family owned and operated, fully licensed and insured, business that services the Palm Beach, Broward and Miami-Dade County area. While most of our services usually apply to homes and commercial properties like hotels, bars and restaurants we also service yachts and ships. Our work has taken us to the Bahamas and even other U.S. states where we have performed repair and restoration services. We take great pride in our work and believe we offer best in breed services to those owners of natural stone surfaces. All our technicians are versed in the types of marble, granite, and other natural stone surfaces and can help you decide which products are best for your home. So regardless of who is visiting and what allergies they may have, we can quickly accommodate you this holiday season. Call Classic Marble Restoration today to protect and enhance all of your natural stone surfaces. Within South Florida, one of the most popular stones in homes and businesses is terrazzo. A popular stone worldwide, it's preferred by homeowners and businesses due to its ability to be easily cleaned. Once professionally restored, terrazzo floors can be cleaned and maintained in a manner that keeps them looking like new. When homes and businesses in South Florida need terrazzo restoration, they turn to the experts here at Classic Marble Restoration. Using a variety of terrazzo cleaning techniques that have been gained through more than 20 years of experience, our restoration technicians know what it takes to do terrazzo cleaning the right way. We offer all customers a 100% satisfaction guarantee, which demonstrates our commitment to providing service that is done right the first time. Having worked with many of South Florida's largest and most recognizable companies, we have gained a reputation for being the best terrazzo polishing and restoration company in Miami and surrounding areas. When you contact us about your terrazzo restoration needs, we're always happy to share testimonials from our many satisfied customers. While terrazzo may be an easy stone to clean, it nevertheless needs to be restored by those with the proper knowledge and experience. Since terrazzo is our specialty, we know just how to clean, polish and enhance the colors that make terrazzo such a special stone. When you need the best service for your terrazzo maintenance and polishing, let our expert staff here at Classic Marble Restoration put their skills to the test. Many homes in South Florida are considered to be the most luxurious in the United States, and one of the reasons why is the use of various stones such as terrazzo. Considered to be a popular stone for interior decorating throughout the world, terrazzo is popular with people because it's one of the easiest stones to clean. 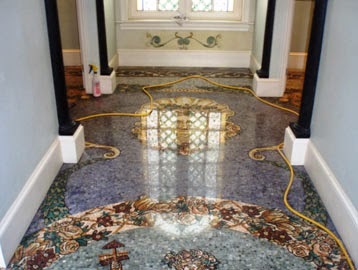 However, terrazzo restoration requires the skills of a professional technician to bring out the vivid colors and shine that are associated with this stone. When people want to keep their terrazzo floors clean and looking like new, their first move should be to contact us here at Classic Marble Restoration. With over two decades of experience in terrazzo cleaning, we know what it takes to make terrazzo flooring look its best. Our technicians are always attending seminars on current trends in terrazzo care and maintenance, making sure they are up-to-date on the latest tools and techniques designed to provide the best service to our customers. One of our most requested services is terrazzo polishing, which always guarantees a look that will please any homeowner. With our offer of free estimates, testimonials and customer service that's second to none, we at Classic Marble Restoration put our reputation on the line with every job we do. However, we are confident that time after time our customers will be satisfied. No matter whether it's a regular cleaning job or specialized job to remove deep scratches, our technicians are more than capable of providing complete customer satisfaction. Homes have their own personalities, and nothing says elegance more than marble. While a beautiful building material, it is also one that requires regular maintenance in order to maintain its wonderful appearance. No matter how careful homeowners are to keep their marble free of scratches, skid marks or cracks it's inevitable that over the course of time they'll need the services of professionals skilled in restoring marble finishes to their true glory. When that's the case, the experienced technicians here at Classic Marble Restoration are available to make homes in Aventura look as good as ever. 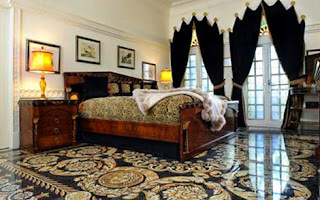 Since Aventura is recognized for having some of the most luxurious homes in the Sunshine State, residents need an Aventura marble floor polishing company that knows how to use the latest cleaning techniques to bring out the beauty only marble possesses. Since customer service is our top priority, we make sure all of our jobs are done to the complete satisfaction of our customers. Our standards are as high as those of our customers, so we treat each home as if it were our own. As our business has grown, our reputation for providing quality service in Aventura and surrounding areas has also grown. So whether it's grinding, polishing, cleaning, sealing, or other services you need for the marble in your home, let us at Classic Marble Restoration put our experience and reputation to the test. Through hard work and a dedication to customer service, we're sure to make your marble look like new. Terrazzo cleaning is a specialized process due to the combination of stone materials and resin adhesives. Classic Marble Restoration located in Plantation, Fla., has expert technicians available to evaluate stone surfaces such as floors, walls and ceilings to provide a recommendation for services. We understand how to care for beautiful designs to protect the colors and sheen. Our technicians also provide terrazzo restoration such as replacing broken stones in small private residences or large commercial properties. Most terrazzo designs in buildings are decorative items such as floors that receive heavy foot traffic. The resins holding the tiles in place develop chips due to abrasive sand particles. Classic Marble Restoration’s goal when working on stone surfaces is to remove hard debris first with specialized vacuum cleaners. Next, we focus on dissolving stains with mild cleansers to improve the stone’s appearance. In addition to improving the appearance of the small tiles, our technicians clean grouting materials. Loose stone tiles require new adhesives to hold the objects in place. We can also replace broken tiles before applying new sealants to the terrazzo to make it waterproof. Terrazzo polishing is an effective way to improve the sheen of old stone tiles that have a collection of dirt. Our technicians use a stone polishing device that suctions debris as it removes a thin layer of material. Many of our customers are amazed at the improved appearance of a floor or wall after a professional terrazzo cleaning. South Florida marble restoration is vital to remove particles of sand from interior and exterior walkways, floors and patios. Buildings located near beaches are especially prone to having sand collect on surfaces, but the particles will also blow long distances. Our technicians know how to clean a variety of natural stone, including slate, marble and granite without marring surfaces. Classic Marble Restoration has specialized vacuuming machines to lift and suction hard particles of sand effectively. Using amateur equipment to remove debris from countertops and floors can lead to deep scratches that will destroy the beauty of natural stone. After we remove large debris from a building’s stone flooring or countertops, we focus on removing stains caused by tree sap or splashed beverages. We know how to clean natural stone located on fireplaces, retaining walls and pool decks with commercial cleansers that do not contain dyes or perfumes. Using harsh cleansers can cause a stone tile’s color to change as the liquid seeps into the surface. In addition, applying too much moisture can lead to cracks in delicate stone such as marble or slate. Our marble restoration business has technicians who are happy to inspect stone surfaces at residential and commercial properties to provide recommendations concerning cleaning and polishing services. South Florida marble restoration services are also available to clean and repair stone surfaces located on a yacht or cruise ship’s decks or bathroom countertops. Many homes across the country have gorgeous marble tile throughout the house. This particular stone is one of the more expensive out there, and it gives the look of elegance and grace when put into just about any type of house. It's great to know that professional Classic Marble Restoration is available to you if you require both marble polishing and marble cleaning. This will allow you to get that stone looking as good as the day it was installed, and it is going to last a lot longer as well when you put the time and care into it that it requires for it to look its absolute best. There are many different tips and tricks for you to ensure that your home's marble looks great all throughout the year, but one of the most important tips for you to utilize is to have an expert company get into the home and professionally polish the stone from time to time. The amount of times you have the stone polished really depends on your own needs and the age of the current flooring that is going to be worked on. You want to make sure that you're keeping the floors looking great all year round, and this can be easy to achieve when you contact Classic Marble Restoration and have them come in to do this work for you. It helps a lot when you have the professionals who are trained and experienced with working with this type of stone.